Dennis Dale 'Denny' McLain was born March 29th 1944 in Markham, Illinois and attended Mt. Carmel High School in Chicago. His career as a baseball pitcher is well documented, along with his dabbling in drugs and other occupations that led to him spending time in prison. That he was also a talented organist is less well known. To be America's No. 1 professional athlete is an honour that comes to few. To be a professional organist is also reserved for a handful. To be both America's No. 1 professional athlete and a professional organist happens but once a century. At 24, Denny released his first record album 'Denny McLain at the Organ.' He also became the first major league pitcher to win 30 games since 1934. Denny McLain Started Playing At Eight 'You might even say music is my first love,' Denny noted. His father was a professional organist in the Chicago clubs; nothing really big but he was tops in Denny McLain's eyes. daughter of the famous baseball player and manager, the first piece of furniture in their home was a Hammond A-100. Denny played Organ on National Television While in New York, he also appeared on a 20 minute segment of the NBC-TV network TODAY show playing the Hammond X-77. Jean Musy was born December 18th 1947, Levallois-Perret, Île-de-France, France. Jean Musy comes from a modest family, his father was a printer. He and his family lived in an HLM building in Levallois-Perret. As a teenager, he discovered the Hammond organ and jazz. From the age of 14, he joined groups of musicians with whom he gave his first concerts in Paris in jazz clubs. At 16, he meets Mickey Baker, American guitarist, studio musician and arranger for Johnny Hallyday, which leads him to become the accompanist of Nino Ferrer. For one year he toured with him and recorded the album "I Would Be Black" in a studio in Dijon. Thanks to Mickey's relationship, Jean Musy is introduced to Joe Dassin. In 1968, Johnny Arthey, the English arranger of Joe Dassin, fell ill. Joe Dassin then asks Jean Musy to write the arrangement of a song that he must record 48 hours later: Les Champs Élysées. Jean Musy is the husband of the singer Claire d'Asta. In 2016, he received the Grand Prix SACEM of the music for the image for the whole of his work. Korla Pandit was born John Roland Redd in 1921 in St. Louis, Missouri, to an African-American family. Pandit's father was Ernest Redd, an African-American man and a Baptist pastor, and his mother was Doshia O'Nina Redd, of French and African blood. Pandit had two brothers and four sisters, all light-skinned like him. He attended a segregated school and learned to play piano. A contemporary of his, jazz pianist "Sir" Charles Thompson, knew him during that time; he said that John Roland Redd was the better piano player. Johnny Patrick was born in Birmingham, Warwickshire, England. He is known for his work on Bullseye , All Star Comedy Carnival, The Golden Shot and New Faces. A renowned Jazz keyboardist, band leader, musical director, and composer. He was Head of Music for Central Television from 1983-1994. 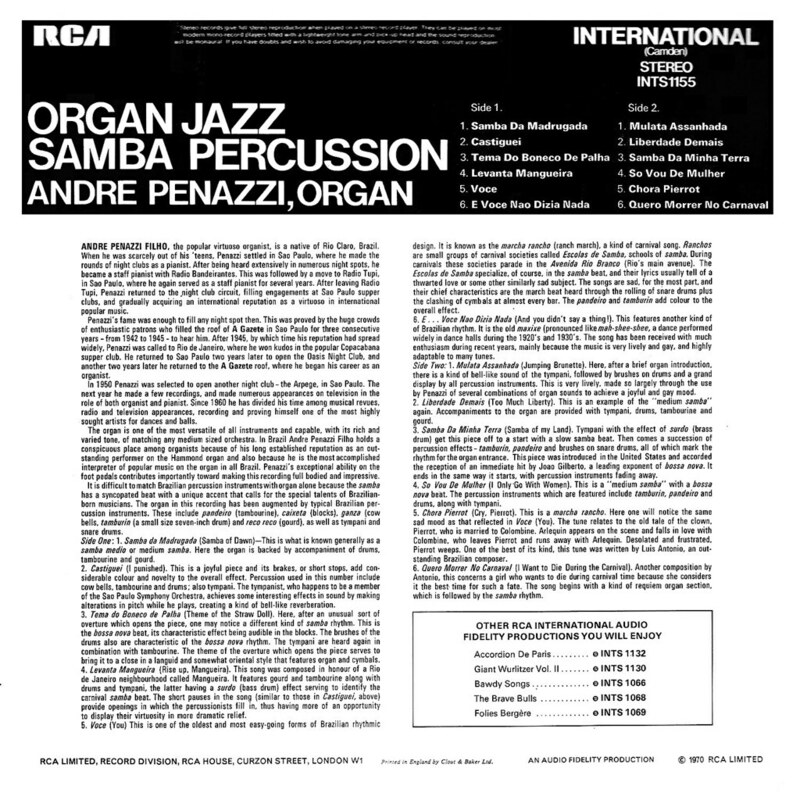 Andre Penazzi Filho is a native of Rio Claro Brazil. When he was barely out of his teens he settled in Sao Paulo, where he did the rounds of the night clubs as a pianist. After being heard in numerous nightspots he became staff pianist with Radio Banderantes. This was followed by a move to Radio Tupi. After a few years he returned to playing the nightclub circuit. In 1948 he opened the Oasis Night Club. Two years later he returned to the roof of A Gazete and began his career as an organist.